Ghostwatch: Behind the Curtains: Can we see that tape? Can we see that tape? Relatively few examples of contemporary media have best withstood the test of time more so than the Video Home System, better known as good old VHS cassette tapes. Tactile, reliable, and still in use today, they no doubt remain an integral part of many Ghostwatchers' early lives. 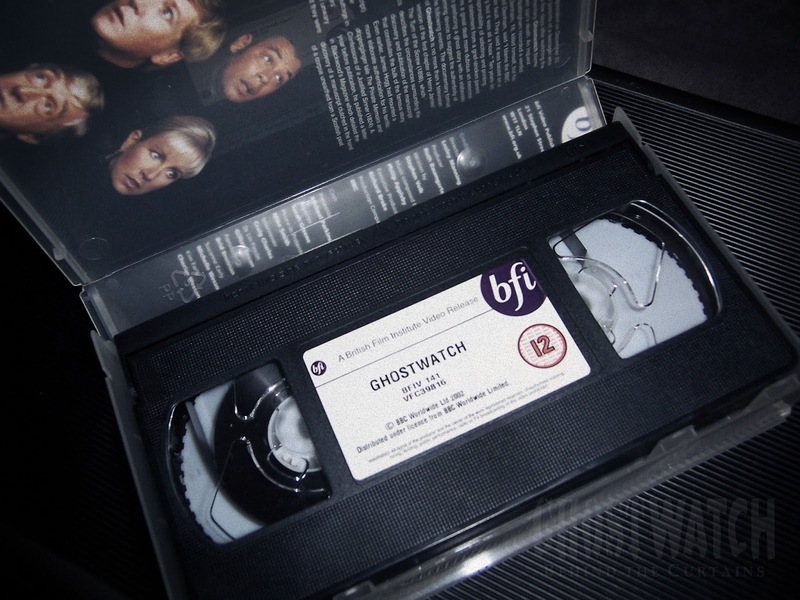 Largely phased out to make way for LaserDiscs, DVDs and other higher-def formats, Ghostwatch nevertheless holds the distinct honour of being one of the BFI's final video releases, released back in 2002. One online project that is dedicated to preserving the memory of these remarkable analogue wonders is VHiStory, a fascinating personal mission to catalogue several thousand individual tapes lovingly stockpiled by reviewer and archivist, Jim Lynn. A couple/few years ago, we reached out to Jim to ask if he might possibly have a copy of the original Ghostwatch trailer, and Outro from on/around the night of transmission. And who would have thunk, earlier this week, a message dropped in our inbox from the man himself, very kindly announcing that he had at long last found a number of interesting clips that he would like to share with us... One in particular, that we at BtC must admit to having never seen before. Not only that, but we were also lucky enough to speak to Jim concerning exactly how this longstanding project of his first came about. You can check out his very own article on Ghostwatch, published today, by clicking here. Hi Jim, what are the origins of VHiStory, and what is your process for reviewing each tape? I’ve had this huge collection of tapes sitting in boxes for such a long time, and always felt like I couldn’t just throw them away. I worked at the BBC as a software developer for about 12 years, and spent part of that time working on some projects related to the BBC archive, so I was well aware how fragile and incomplete even professional broadcasters’ archives can be. Every Doctor Who fan knows this deeply. I couldn’t bring myself to simply junk all the tapes, so I’ve wanted to digitise them for a long time, and when I started, I knew that part of the value would be to find out if anything on the tapes was something that didn’t exist anywhere else. The only way I could think of to achieve this was to catalogue the tapes in public, so people could find a reference to a long lost programme if they searched for it. Because I genuinely don’t know what is important on any of the tapes, that forces me to be almost obsessively detailed. Sometimes I think I was mad deciding to log every instance of every advert, but I feel that’s the only way an archive like this can have any value. I’m not a professional archivist or researcher, but being a computer programmer, I have some of the completist instincts necessary for a project like this. The archival process has two phases. The physical digitising is ongoing, and I can record two or three tapes a day onto a bank of 4TB hard drives. But the blogging is a slower process. I transfer a few tapes worth of MP4s onto my laptop at a time, and create a Wordpress blog entry for each tape. I try to watch as much as I can, but there are some programmes that I just can’t muster the enthusiasm to watch. I capture screenshots as I’m watching, and I’ve written an app to capture, crop and upload images quickly – that used to be a fiddly, manual process. My ‘rules’ are that I want to be able to call out every individual ‘item’ on each tape, whether that’s a single programme, a fragment of a programme, or the individual trails, adverts and continuity between the programmes. This is because it’s the ephemeral stuff between the programmes that’s more likely to be something that doesn’t exist anywhere else, and that’s the whole reason for doing this. My ‘reviews’ of programmes are more like a ‘live blog’ of the programme. I’d rather talk about strange glitches, early appearances of now famous actors, and examples of how much things have or haven’t changed than write a critical analysis of the programmes – although for the programmes I really love, I’ll talk more about why I love them. How did you come to amass such an impressive library of recorded cassettes? I bought my first VCR in December 1984, with almost my first paycheck. At first I assumed that I would probably just use it for time-shifting, but I found that pretty soon, if I cared enough about a programme to record it, I’d care enough to watch it again, so I started amassing more and more tapes. I eventually had at least two VCRs set up, so I could record multiple overlapping programmes if necessary, or simply ensure that I kept one programme together on the same tape, something I preferred to do. I think at one point I actually had three VCRs on the go at once. 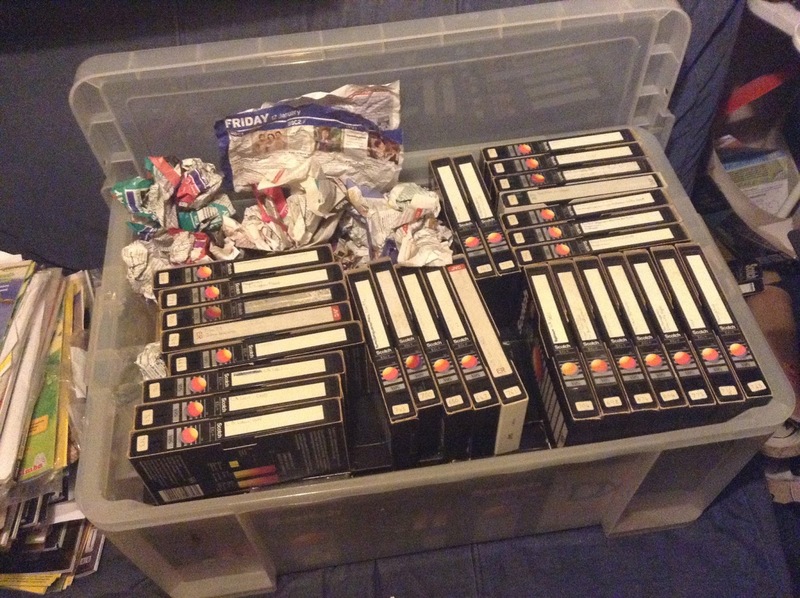 But the simple fact is, 16 or 17 years of recording TV to VHS and an unwillingness to tape over a lot of it meant I’ve eventually got almost 3000 tapes of TV programmes. How long have you been working on the project, and how long do you estimate it could take to fully exhaust your collection? I started in January 2014. I’d been made redundant from the BBC the previous year, and had been working on some programming projects during that time, but hadn’t taken on any more full time work, and my wife suggested I use the time to start digitising the tapes. They’d been sitting in our garage, mostly stored in large Really Useful Boxes, so apart from changes in temperature, they’d been kept in fairly good conditions, and I’d been saying for years that I’d like to digitise the collection, but it had always seemed a daunting prospect, given the scale, and the amount of storage I’d need. I’d made an aborted start at doing this about ten years ago, using a DVD recorder to digitise the tapes, but it was a fiddly process, the discs were unreliable, and it was very manual and intensive. Plus, the resulting recordings weren’t always the best quality. I’d been given an Elgato HD video capture device as a leaving present from the BBC, and found that it happily digitised the output of a VCR, so I did some tests, and discovered that if I kept the recorded bandwidth really high, I could capture the output of the VCRs with very little loss in quality. In theory, VHS has a very low bandwidth, so you could use a very low bandwidth, but that would tend to make the resulting recordings very mushy and blurry, and lose what little detail the tapes had originally. Ramping up the bandwidth means it’s as close to the actual output as possible, which I think is important for archival purposes. According to my database of tapes, I’ve digitised over 2,700 tapes, and have less than 300 tapes left to archive. This means I’ll probably finish the archiving part of this project in the next few months. The blog is another matter. When I started, I published the blogs as I wrote them, and was writing several a day, but for a while now I’ve been on a daily schedule, one tape a day, although I still do write them in batches and schedule them. I’ve published 1163 entries so far, one per tape, so I’ve still got around 1700 tapes left to blog about, which means, if my maths is right, I won’t finish all my tapes until March 2021. I don’t know what I’ll do after that, to be honest. Maybe I’ll start logging all the digital TV captures I had since I started recording TV digitally, around 2002. What did you set out to achieve with the project, and has there been any particularly memorable or unexpected feedback you've received over the years? For us, Red Dwarf connections often pop up now and then, particularly with Craig having featured in both shows (I believe we may first have heard about VHiStory through our friends at Ganymede & Titan). Some of the nicest feedback has come from people who have featured in programmes. One man remembered being an extra as a schoolboy in a BBC film many years ago, and I was able to find the scene he was in, and find a picture of him. Fans of shows like Red Dwarf certainly like to see everything there possibly is about their shows, so having some rarely seen BBC continuity for early Red Dwarf was nice. And recently, I was able to help the Galway Film Festival with a copy of a short film they wanted to show, because it had been featured in one of the programmes. That was nice because my mother was born in Galway, and I’ve been there often on holiday. You often mention and detail ad breaks in your posts. When I myself very occasionally rediscover an old tape, I often find they have the capacity to serve as a kind of historical touchstone. For my taste, you can glean quite a bit of information from ad breaks, alone – particularly how noticeably they have evolved production-wise, over the years, but also in terms of our then-buying habits, public information announcements, and the like. What are your thoughts on the inherent value of archival advertising? I agree, I think it’s hugely valuable, especially when we can see context, and the great changes in how adverts were made, and what was advertised. For example, I hadn’t realised until I started this how much the 80s was dominated by money. Every other advert seemed to be for a bank, or investment company, or a share opportunity. And Champagne was frequently advertised as if it was a commonplace, like oven chips or shampoo. I sometimes think there’s a book or a TV series to be made about how adverts changed, even in the short time I was recording them. Absolutely! I'll never forget, whilst researching newspaper clippings for the doc at Central Library's archival microfilm department, how noticeably both tabloids and broadsheets had changed in such a relatively short period of time. It can be incredibly difficult to find VCRs these days, yet there still seems to be a following - and certainly collectors who continue their search for rare tapes. Notably, Matthew Holness’s 1970s-inspired, pulp comedy drama, A Gun For George was recently released on the format, no doubt for added ‘authenticity’. What is it about VHS as a medium that you feel still appeals? Would you say VHS is in some ways, more user-friendly (hands-on, durable, etc) than even some modern-day formats, and what is your preference format-wise? Even though I do have a lot of residual nostalgia for VHS as a format, having grown up in the VHS era, I was a very early adopter of digital formats. I started collecting DVD before the format was even launched in the UK, and I started moving over to digital TV recording in 2002 when I bought a TiVo, and when I moved over to a Home Theatre PC shortly after that, and started archiving to hard drive, I never looked back. What’s strangest (to me at least) is that these days I don’t record anything. When my old HTPC started dying a while ago, I decided not to replace it with another, because I was actually watching TV almost exclusively on iPlayer (or similar services). I use iPlayer, Netflix, Amazon Video and Now TV for most of my TV watching, and, surprisingly, I don’t often feel regret at not having a permanent recording. Maybe I’ll regret it in ten years time. I'm sure your piece on Ghostwatch will go into greater detail concerning any feelings or recollections you have concerning the show, but briefly, are you a fan? :) Do you recall the night of transmission? And what are your thoughts on its continuing legacy? I think it was a magnificent programme. It’s not perfect, and I talk a bit about how a couple of the performances don’t quite feel true, but I think it’s one of the most brilliant uses of the television medium there has ever been. It was a fictional story, but one which played with virtually every facet of television production, and audience expectation, and I think it deserves to be regarded as an all time classic, just as much as something like I Claudius or Tinker Tailor Soldier Spy. I have to admit, I didn’t watch it going out. I was out that night, so I recorded it, which is how I got some of the surrounding continuity. And I think I already knew what it was, so I don’t think I would have been taken in. The Radio Times did a cover story on it which, I think, either hinted or stated outright that it was fictional. My memory of the time was that I was a bit dismissive of people who thought it was real, because all the pre-broadcast coverage seemed to make it clear that it wasn’t. But that might just be hindsight working. In a way, the programme’s absence from broadcast TV has probably helped it keep its mystique. Things like this are much better when vaguely remembered. My appreciation of it has grown since the broadcast. I was probably too critical of the few weaknesses I saw on first viewing, because when I re-watched it a few years later, I was surprised to find myself drawn in again, and I found the ending more disturbing than I had the first time. And time has helped me appreciate just how clever the production was, how it played with all our expectations of the form, and how it practically invented an entire genre of Film and TV. It’s now become a Halloween tradition for me. I like to watch it each year, and I always enjoy it. With many thanks again to Jim for contributing this great interview, and sharing those ace clips. For more on VHiStory, be sure to check out his blog, and hit as many subscription buttons as you can!